My son has discovered that he loves seafood, and I couldn’t be more excited. 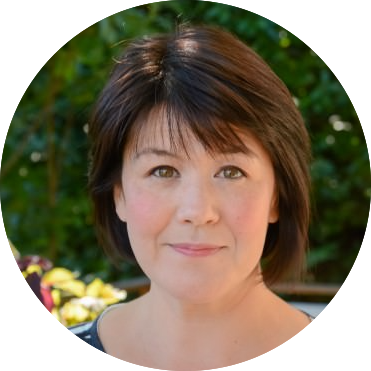 It’s a departure from hamburgers and macaroni and cheese and a lot easier to create healthy dishes that he loves and as a bonus most seafood is easy to prepare with minimal effort. Unfortunately, my husband doesn’t like any fish at all, so I still have to come up with two dinners on the nights we eat seafood, but it’s better than three separate dishes. We’ve been focusing mainly on sushi, but I thought I’d try to create a quick stew that I could mostly make ahead and then finish it up quickly when we get home late from a tutoring session or basketball practice. This is the kind of dish that I could eat every day. 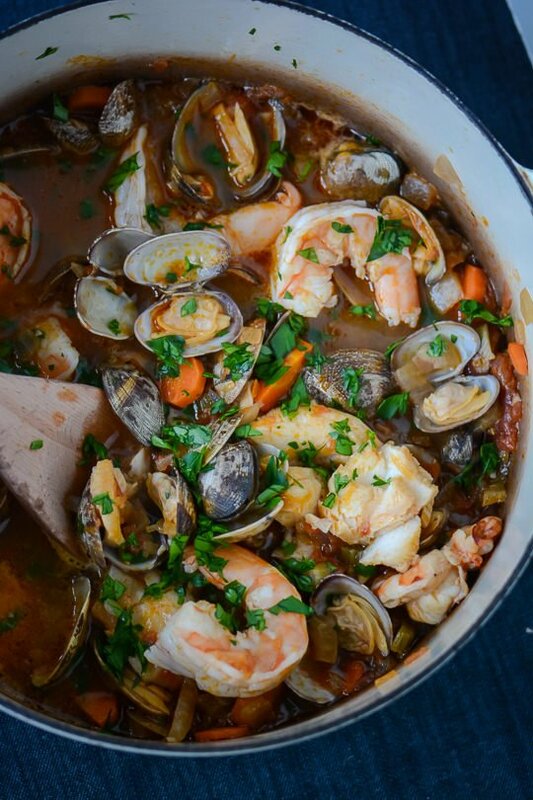 The clams make the broth and give you a depth of flavor that you would otherwise need a lot of time to develop. 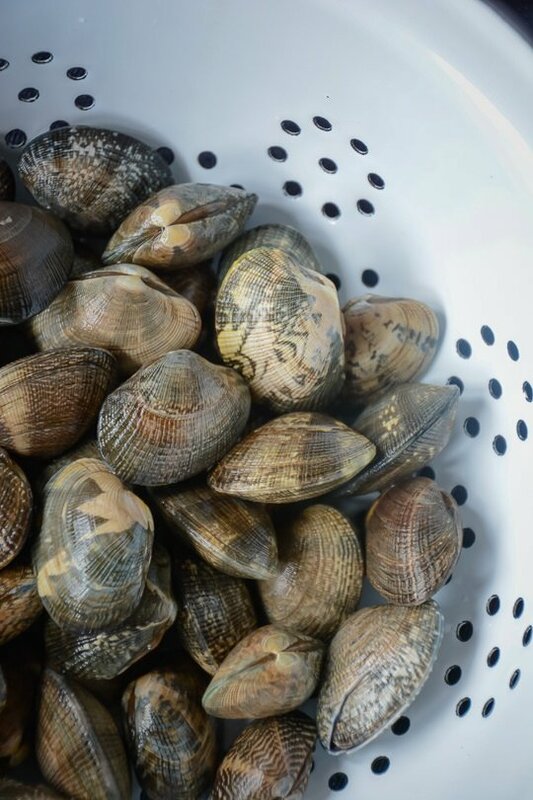 If you don’t want to use clams, consider browning up a little chorizo or sausage to help develop flavor quickly. 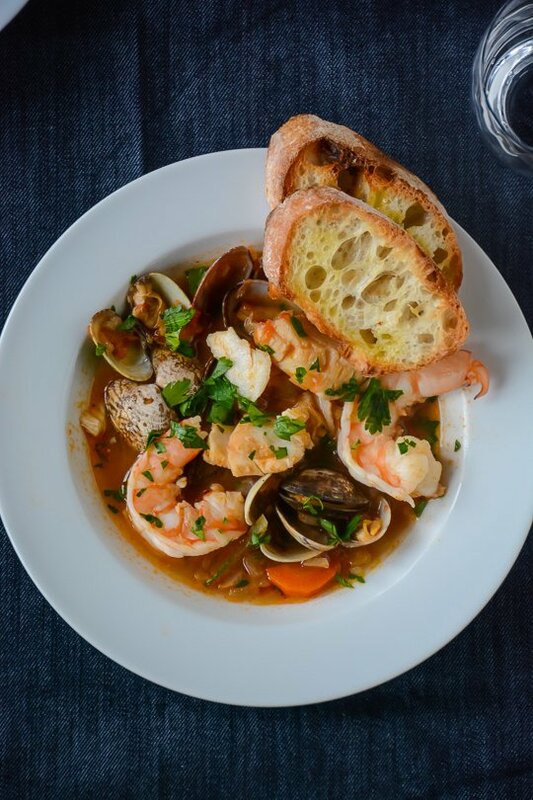 The broth comes together quickly, but you can prep it the night before and all you need to do is take 5 minutes to heat it back up and add the seafood. We ate ours with some toasted crusty bread, but you could also add some white beans instead to keep the dish gluten-free. To get this on the table in 30 minutes you will need to start with shrimp that is peeled and deveined. Most markets offer them prepared as long as you are willing to pay a premium. If you need to clean and devein the shrimp it will add an extra 15-20 minutes. 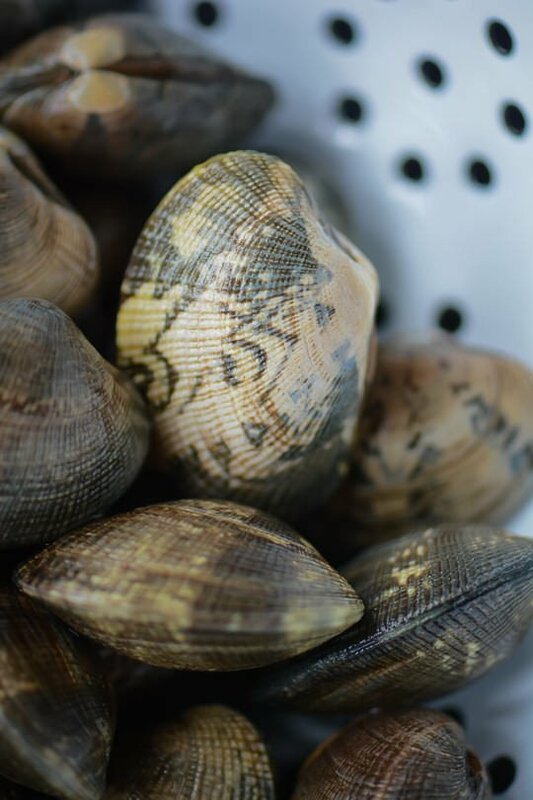 The clams give you a depth of flavor that you would otherwise need a lot of time to develop. 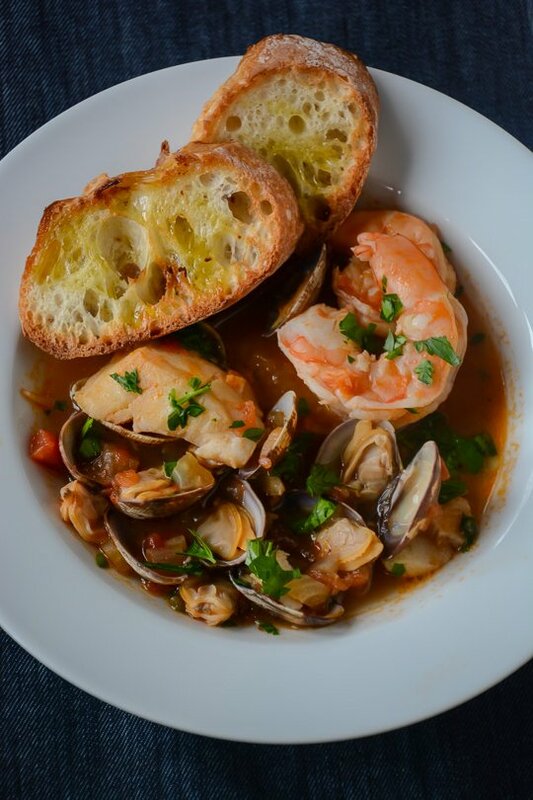 If you don’t want to use clams, consider browning up a little chorizo or sausage to help develop the flavor. 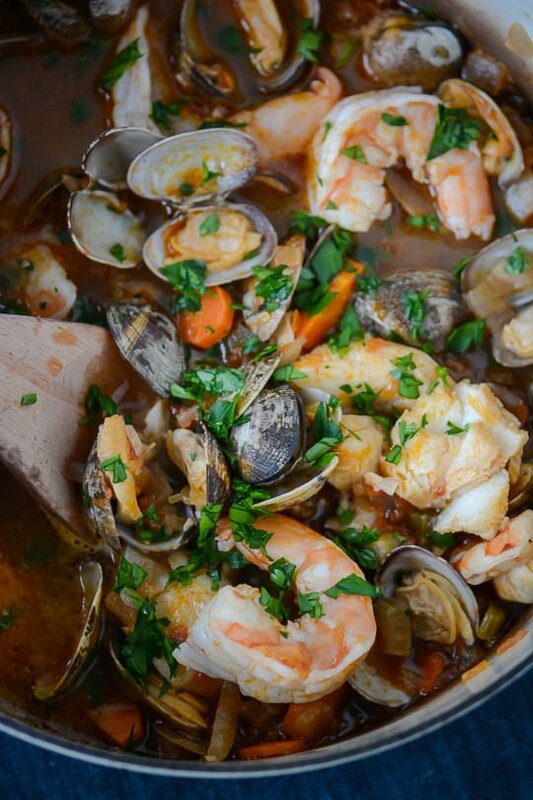 The broth comes together quickly, but you can prep it the night before and all you need to do is take 5 minutes to heat it back up and add the seafood. We ate ours with some toasted crusty bread, but you could also add some white beans instead to keep the dish gluten-free. This stew is the perfect dish for entertaining. 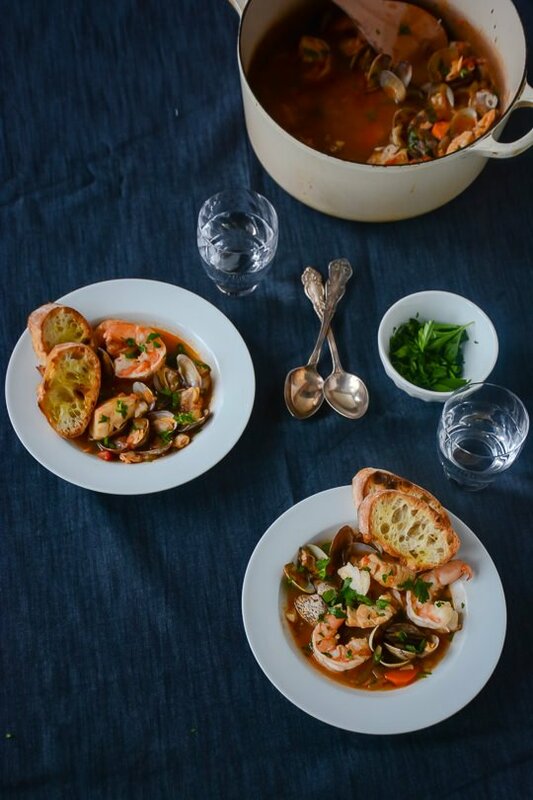 Make the broth the day before and add the seafood five minutes before you want to serve it. Toast up some bread and you'll have a dinner that will impress! In a dutch oven, heat the olive oil over medium heat and add the fennel, onion, carrot and thyme leaves and cook stirring occasionally for 5 minutes until the vegetables have softened. Add the garlic, tomato paste, fennel seeds and fish sauce and cook for 2-3 minutes until the paste darkens slightly. Add the white wine to deglaze the pan and cook until the wine is slightly reduced 1-2 minutes. Drain the tomato juice into the pan and then crush the tomatoes with your hand or the back of the spoon into bite-sized pieces. Add the clam juice and bring the mixture to a simmer. You can prep the broth to this point, let the soup cool and refrigerate overnight if desired. To finish the stew add the fish to the pot and cook for 2 minutes. Add the clams and the shrimp to the stew and cover for 2-3 minutes until the clams start to open and the shrimp is cooked through. Taste for salt and pepper and sprinkle with the parsley. 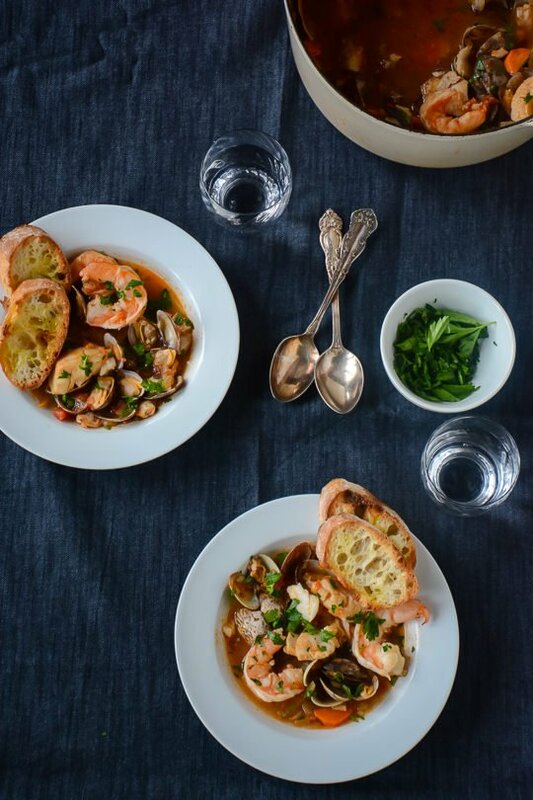 Serve the stew with some crusty toasted bread rubbed with olive oil and lemon wedges. That is such a nice thing for you to say! I’m so glad that you’ve enjoyed the recipe, it’s one of my favorites!